Japanese Maples are a bonsai classic. Kiyohime is a low spreading cultivar which lends itself to broom style. 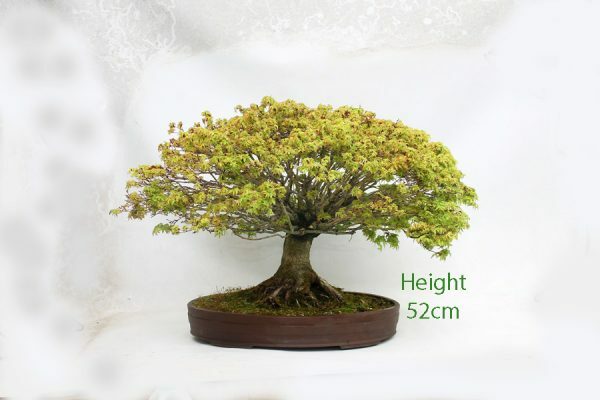 This is a large and impressive specimen, 75cm wide with a 20cm nebari. Indifferent to the cold, hardy to minus ten degrees. Provide some shade from strong sun. A sheltered spot of out strong wind is recommended to avoid damage to the delicate foliage. It is wise to be especially careful with them in early spring, when wind and frost can damage the delicate new foliage. Price listed is by collection only. Delivery is possible. please contact us for details.